Christine Baldwin RPT has practiced physical therapy for 30+ years. She welcomes you with a compassionate heart, clearly listens to your words and to your body’s wisdom in a masterful way that allows for both a deep level of acceptance and the adeptness to guide and facilitate your wellness, your healing, your health, and your self- actualization. 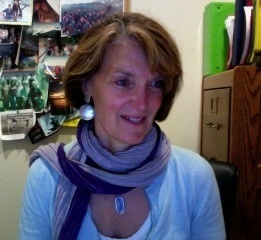 She graduated from the University of Connecticut in 1974 as a licensed registered physical therapist. She is a longtime member of APTA, both nationally and locally. She has trained with the Upledger Institute, the ZeroBalancing Health Association, and other specialists in manual therapy, movement and the study of energy and structure. She is certified as a ZeroBalancer and a CranioSacral therapist. Christine has worked in a variety of settings including: National Medical Care, Cerebral Palsy Center, Southern Maine Resource Center, Public Schools in the state of Maine, and Adaptive Movement Services, P.A.. Her practice has included work with adults and children with a variety of challenges, health issues or seeking to raise their consciousness and promote wellness in a proactive way. She has had extensive experience in adaptive aquatics, therapeutic horseback riding, and adaptive skiing. Christine is the proprietor of Summit Spring Holistic Health Center and Adaptive Movement Services, P.A. in Poland Spring, Maine where a holistic approach to treatment is offered in a rural setting. Christine’s philosophy is to use skilled techniques as we listen and respond to the natural and unique rhythms of the body to enhance the BodyMindSpirit’s natural healing abilities. She is cerified as a ZeroBalancing Teacher and Summit Spring Holistic Health Center hosts regular classes in this healing work. Christine brings a unique level of teaching as she meets people from all walks of life and adapts to different learning styles with a compassionate and clear presence, along with a deep knowledge and understanding of the work. Christine creates a sacred space to guide and facilitate you from a place of years of experience and a heart of loving-kindness.